I think I understand Stan Lee much more as an adult than I did as a kid. I think he created the Marvel Universe idea not because of a driving artist vision, but because they could not complete with DC making the same product. His understanding of the business of comics lead him to create something great. On the bad side Stan seems like a huckster. He is living off creations from the 60s. He has not been a great comics writer in a long time, but he still finds ways to be in the media. On the good side, Stan loves the fans. He never talks bad about people who buy comics. He still loves comics and super-heroes. He also speaks well of the people who write comics now. I have never heard him be a grumpy old man. These are good things. 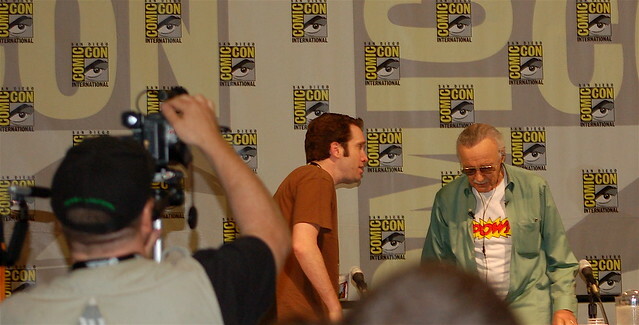 At comic con people treat Stan Lee like a god. People flock around him everywhere he goes. He as to walk around with security so he does not block up the place. People mob him everywhere he goes. He still stops for as long as he can and talks to people. Stan Lee might has some strikes against him, but I think that the good outweighs the bad.